The Reef Summit 2010, under the theme "Someday is Now! Save our Reef, Demand a Plan", held its grand opening ceremony on Thursday November 11th at the Bliss Performing Arts Center. The summit was a three day event, culminating in a picnic at Goff's Key.The opening ceremony was well attended, boasting the participation of Lady Kim Simplis-Barrow, first lady of Belize, Actress/Activist, Ms. Daryl Hannah; Aerial Art Work expert, John Quigley; Director of Healthy Reefs for Healthy People Initiative, Ms. Melanie McField, Phd. ; Mexican delegates, other distinguished guests; as well as members of the media. Words of welcome were given by Mr. David S. Smith, Founder/President at CAVU (Clear Altitude Vision Unlimited). Mr. Smith had been visiting the country of Belize for over 25 years conducting various surveys and flying at low levels over the entire country of Belize, working on conservation projects. He commented on the many wonders of Belize; its spectacular Mayan Ruins, lush jungle, caves, waterfalls and rivers, warm and welcoming people and the central focus the Belize Barrier Reef, the country's crown jewel.During the opening ceremony, Dr. Robert Tench, Marine Biologist was awarded the Healthy Reefs for Healthy People Initiative Lifetime Achievement Award. The award was presented by Lady Kim Simplis - Barrow. This was followed by a musical interlude by Lloyd Auguistine and the Garifuna Collective; leading up to the premiere screening of "Someday is Now". The second day was a day of information dissemination and education. Dr. Leandra Cho-Ricketts, Environmental Research Institute, University of Belize started the presentations with a presentation on up coming research activities and marine research gaps. Ms. Maria Eugeña Arreola, of the Mexican Fund for the Conservation of Nature gave a very stimulating presentation on the Mesoamerican Reef Leadership Program. Mrs. Julianne Stockbridge, Oceana along with her Reef Management Actions Panel, gave highlights of key management actions across the region; key successes from the region - blue ribbon management issues in report card and gaps/areas for improvement. Dr. Melanie McField presented the Report Card for the Mesoamerican Reef: an evaluation of Ecosystem Health 2010. Using data collected by various sources from past years, a booklet was created depicting the changes in reef health, shifting baselines and reef health, increasing threats to the reef health, tracking coastal development and climate changes and how all these factors impact the reef. Not only did this report card point out problem areas, visibly improved areas, but it also gives suggestions on how we can better manage our reefs to maintain it as a jewel for generations to come. Current issues such as; Ocean Acidification and Global Climate Change effects on reefs, Coral Bleaching and the Sea of Plastic Debris were also discussed. Ms. Nadia Bood of the World Wildlife Fund gave a very informative presentation on Belize's Perspective on Global Climate Change Impacts and Adaptation Strategies. Actress and Activist, Ms. Daryl Hannah gave a brief presentation on her activist work with the reef conservation projects among other projects. All presentations focused on the present state of the Mesoamerican Reefs, problems currently facing and on suggestions on ways of conservation. The summit ended on Saturday November 13th, 2010.as hundreds of Belizeans as well as international supporters converged on Sergeant's Key. It was a day full of fun and sun. Divers and snorkelers alike came together. Sporting bright colored shirts; red, blue, green, purple and burgundy were among the colors worn on Saturday. Boats left the shore in Belize City at 9:00am sharp en route to Sergeant's Caye. At the Caye, over 300 participants converged on a very small piece of land mass surrounded by about 2 ft of water. Standing hand in hand or sitting close to each other, participants used their bodies to create messages that would be photographed from a helicopter. 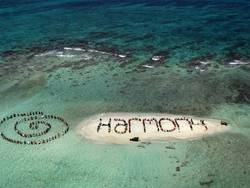 A human spiral and banner were created; calling for humanity to be in harmony with our natural world. The action was part of the launch of the Harmony Initiative, a partnership between the film "Harmony" narrated by Prince Charles, and the Global Campaign for Climate Action.Caye Caulker Ocean Academy participated in this world class event by seeing the participation of over 25 students. Caye Caulker Roman Catholic School was also represented as some 8 students from the RC school participated as well. In total, approximately 45 individuals from Caye Caulker took part In the Aerial Art Work presentation. The day ended with a picnic to at Goff's Caye. According to Science Teacher from the Caye Caulker Ocean Academy, Ms. Sarah Requeña, "this was a wonderful chance for the children to get out and be a part of this event. It is something that will remain in their memories for a lifetime. And looking at the pictures, the students are very excited and hyped that they were able to be part of that."